A new year — always filled with anticipation and renewed hope. In our parish in the coming year, many couples will celebrate their new beginnings by pledging themselves in marriage before God, and others will be welcoming children and baptizing them into the faith. Those sacraments are just the beginning. “From the vantage point of faith, there are wondrous chances for new beginnings,” Father Jim Cesta said. “There are folks of various ages who have already chosen to begin again practicing our Catholic faith with being present at weekend Mass and wider involvement in parish life. Two couples who celebrated new beginnings in the span of just over a year are Richard and Anastasia Ferrone and Matt and Angela Pastor. Richard, 29, and Anastasia 23, began a new life together when they were married by Father Jim on Aug. 5, 2017. Nearly 14 months later, another new beginning for the couple — their daughter Stassi Grace was born Sept. 25, 2018. Quite a year for the couple. “We made some pretty major life changes in a short period of time, but I wouldn’t have had it any other way,” he said. “I knew Ana was the one for me and marriage is something we both strongly believe in. We also both knew we wanted to be parents and feel so blessed to have had Stassi so early in our marriage. Rich and Ana said becoming parents is one of the best things that have happened to them. They say they have grown closer just by talking about how they will raise their children in the Catholic community and making other decisions that will affect their lives. Matt and Angela Pastor and their daughters Emily, 7, and Adalina, 7 months. 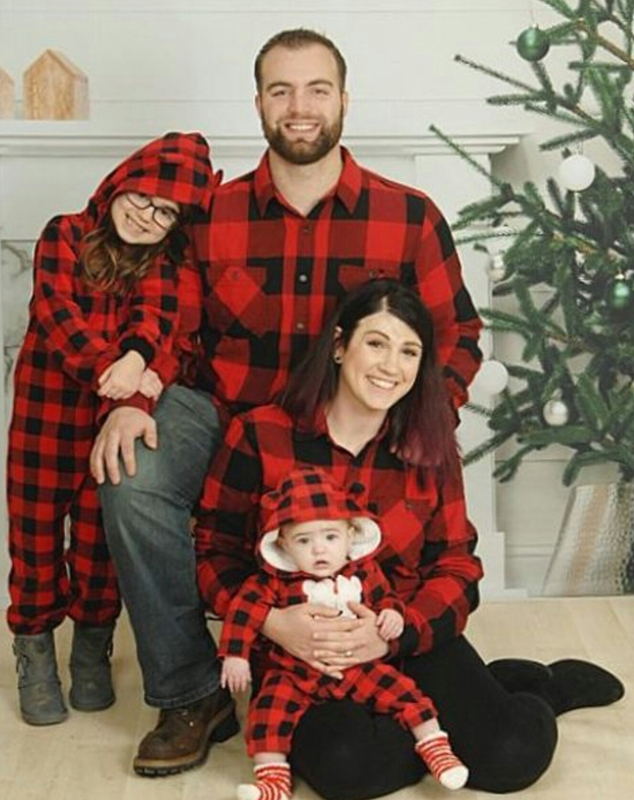 “We’ve learned that no family is perfect, and even non-traditional families are still a family,” Angela said. Matt Pastor and Angela Pastor also had a year of new beginnings in 2018. They were married and also had a baby — daughter Adalina, 7 months old. She joined big sister Emily, age 7. Their path to the altar was a bit different than the Ferrones. Angela, however, was more cautious. “(Dating) was difficult because I knew I had to find the right person for not only me, but my daughter as well,” she said. The couple became engaged on Christmas Day 2016. “I felt like it was time,” Matt said. “I was excited, nervous and ready for it. I was excited to make the family bigger and official. “I knew that Matt was the right choice though, so I was excited,” she said. Both couples said faith has played a role in their relationships. Rich and Ana said it was special having their child baptized at Mount Carmel / Blessed Sacrament — the parish in which they grew up. 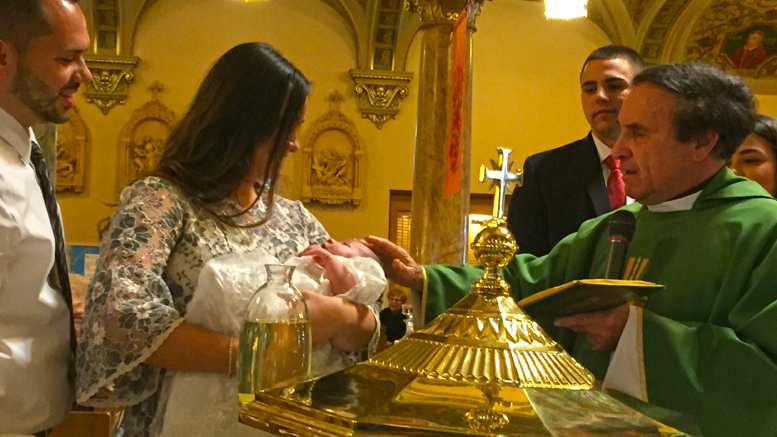 “It was amazing having Stassi baptized at Mount Carmel by Father Cesta. It is so special knowing all three of us have made that sacrament in the same place. Faith also is important for the Pastors. Angela, 29, always has been a member of Mount Carmel. Her parents were married here and they attended 8 a.m. Mass every Sunday. Matt, 27, was raised Catholic. He was born in Rochester and attended St. Theodore’s Church, and then St. Mark’s Church once he moved here. He started attending Mount Carmel / Blessed Sacrament once he and Angela started dating. As their lives progress in the coming year, both couples are looking forward to their new families and the blessings and challenges it brings. The Pastors also have advice to share. Father Jim said starting anew can be good for everyone. “Sometimes we sing or pray that our God is a God of second chances — another opportunity to start over,” he said. “Reflecting on this idea of a new beginning leads us to realize the whole church and our individual lives are always in need of starting again because we fall flat on our face, we take two steps backward rather than forward. It’s part of life and learning.